SUMMARY: Isaiah comes from the streets. He's tough. He's broke. He's trying to get over Beth, the love of his life who recently chose another over him. Rachel's life appears to be perfect--at least on the outside. Her family is a mess, however, and Rachel's increasingly dangerous panic attacks are proving that. When a chance meeting at a drag race brings Rachel and Isaiah together, both inadvertently become indebted to a powerful street thug who threatens violence if they don't pay him $5000 within six weeks. 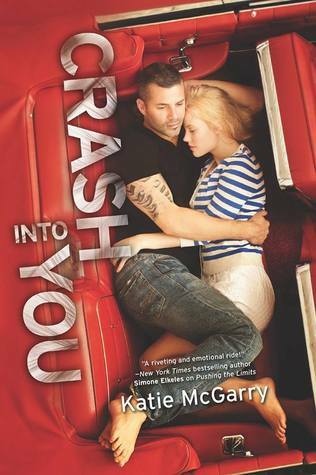 REVIEW: Though I loved Pushing the Limits and Dare You To, Crash Into You is definitely my favorite in the Pushing the Limits series! I absolutely adored Isaiah and Rachel, and I love how I felt their connection, right from the beginning. Fans of the previous two books or of the Perfect Chemistry trilogy (Elkeles) and the Hundred Oaks series (Kenneally) will not be disappointed. I had planned to read Crash Into You and another book (Solstice by PJ Hoover) at the same time. I learned this trick when I was in college and had to read tons of "stuff" in a short amount of time. So, I was going to read a chapter from Solstice, then a chapter from Crash Into You, then a chapter from Solstice, etc., until I finished them both. It went more like, a chapter from Solstice, then all of Crash Into You. I chuckled this morning when I opened Solstice and found my bookmark sitting at Chapter Two. And the characters! Both lead characters are believably flawed, and their families are believably dysfunctional. Though Isaiah's mom had been serving ten years in prison for burglary and he's never met his dad, I think Rachel's family takes the prize as the most desperately in need of psychological intervention. If I were Mo from Inkheart, I would have read Rachel's mother out of the book just so I could slap her. THE BOTTOM LINE: For me, the best one in the series so far. This series is a must-read for anyone who loves contemporary romance involving a "good" girl and a "bad" boy. The books do not need to be read in order, but it's probably a good idea to do that if you can. STATUS IN MY LIBRARY: We can't get it due to mature sexual content, but it's a must for high school libraries. This was the first Katie McGarry book I've read, and I was completely blown away! This is such a fun, emotional and downright gorgeous story! I connected right away with Isaiah and Rachel, and not just because I grew up with a car-lovin' mechanic father. I loved how both 'voices' pulled me completely into their world; it was such a rush. A HIGHLY recommended read.